The lesson that changed his life. A school in struggle and strife. A government that uses a knife. **** (Scotsman, Stage, List, BroadwayBaby.com, FringeGuru.com, Boyz Magazine). ***** (ScotsGay, for Canoe). 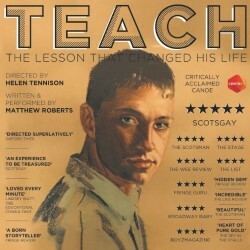 'A born storyteller' (FringeReview.co.uk). Directed by Helen Tennison: 'fierce energy' (Times). 'Loved every minute' (Lindsey Watt, Educational Consultant, OBE).